Heel spurs – A source of heel pain? For anyone who has been limited by severe heel pain and has sought out a physician, you probably already know what an x-ray of your feet look like. X-rays are an easy and relatively safe means to rule out any bone pathology and help get to the root cause of your heel pain. As experts of the foot and ankle, your Austin podiatrist has the most experience reviewing x-rays and the pathologies that they can show. Unfortunately, there are some medical specialists who may have shown you an x-ray of your feet and pointed to a heel spur on your bones noting that this is the source of your pain. 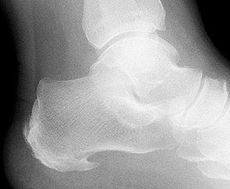 While there is the rare case when a large bony prominence can pinch associated structures, heel spurs are often the result of a long standing condition and rarely the source of your pain. So if it is not the spur, what is causing your heel pain? A quick review of some of the anatomy of your foot will help us understand what is going on and why you have a heel spur. Beneath the arch of your foot is the plantar fascia. It originates at your heel bone and inserts into the balls of you foot. This ligament helps to support the arch of your foot and the muscles, nerves and vessels above it. For a number of reasons, that may include weight gain, foot mechanics (such as over pronation or equinus deformity), the types of shoes we wear, or a lifetime of walking on hard surfaces can all lead to tightening and pain in this ligament. Because our daily activities have led to this change in the soft tissues, the first line of treatment is often stretching and relieving any inflammation through the RICE principle. Once the pain is removed and healing of the fascia takes place, it is important to prevent this tightening from reoccurring. This is best achieved through custom orthotics or inserts for your shoes to adjust the alignment of your foot. Only in the rare instance do these early conservative treatments offered at Austin Foot and Ankle Specialists fail relieve most cases of heel pain. Removal of heel spurs is almost never necessary as there are many other conservative treatments, including ESWT, which will get you back on your feet minus the heel pain! !